If you would understand the temperature of the planet, you must understand the half that is the Pacific Ocean. UPDATE: I’ve added a bit on the Hawaiian Island area at the bottom. we saw that in 1992-93 there were 401 net thermometers deleted from the entire Pacific Region. The same number as removed in Australia. If Australia were removed from the statistics, the Average Pacific Temperature stabilized a great deal. Further, we found that Australian thermometers migrated north over time, toward the hot equator. Here, we will look more closely at New Zealand and the rest of the Pacific Ocean. In particular, taking New Zealand out of the whole record leads to even greater temperature stability in the Islands. If the half of the planet that is the Pacific Basin is not warming, it can hardly be “Global” nor “Warming”. When we look more closely at New Zealand, we find more thermometer changes. “Global Warming” is an artifact of thermometer change (both modification history and location) over time. This is the usual South Pole on the left, North Pole on the right. We can see the drop out of the more northern thermometers in WWII. Then the general spreading out of thermometers over time resumes. Then a startling thing happens. The northern 35 S band jumps up from 25.7 to 36.1 percent at the same time that the more southern 50 S band nearly evaporates, dropping from 11.3 percent to 3.6%. That far south near Antarctic Island just had to go! The warm tropical islands up near 25 S get restored from 8.5 to 12% and the 45 S to 35 S main band get a boost. We can easily see here the expectation of 20 years of “warming of the record” from about 1989 to 2009 as the thermometers run away from the pole. Bad case of “polarphobia” if you ask me! Zooming in a bit on those years it is pretty clear that the “action” all happens in the 2002 to 2003 transition with the complete deletion of those thermometers (and the only reason we have even 3.6% in the decade is an artifact of averaging… another reason not to like the “average thermometers approach”…) We also see that the ‘swoon’ in the north was just a data dropout in a couple of years, not something systemic. Wonder what got nuked in 2002? When dealing with a small place that has a large impact on the surrounding Grid Boxes and Zones (up to 1200 km in all directions from an island), the deletion of a single near polar island can cause the thermometers 1200 km north to be extended “down south” (via the “reference station method” in GIStemp). This is an example of where “Grids and boxes” will not make the situation better, but will make it far worse than this simple average benchmark. Comparing 1989 to 2009, we can see that in the last 20 years, Kiwis have been playing with their instruments! What was left over for 2009? Eight thermometers. All of them with either the word “WARM” or “WATER” in the name. So what about those snowy mountain peaks? One of the interesting things, here, is that number right after the latitude and longitude and the one butted up against the Rural Urban Suburban flag. That’s the elevation in meters. Measured 2 different ways. The first is measured, the second is “interpolated” from a data base. They are usually close to each other. What I see in this series is a fairly rock steady trend between 11.x C and 12.x C with some rolling. Hot in the 1939’s, cold in 1950, but hitting 13 C in 1956; then cool again in the early 1990’s until Campbell Island was sunk and the average is “juiced” about 1 C as a step function to be consitently 13.small C since then. Now I’m certain that the AGW True Believers will try to hand wave this away with Zones, and Grid Boxes, and Anomalies (Oh My!). But the fact is that the GIStemp code, with the deletion of that island, will no longer be able to “fill in” the grid boxes around that island from that island, and they will start to reach out further looking for a thermometer to use. And those thermometers will be the warm ones on the beach of New Zealand. Up to 1200 km away in GIStemp STEP2 alone. Grids and boxes will spread this heat south to where there was a thermometer in the past, but that is being used no more by GHCN. Notice also how February / March and October / November show jumps rather well? (May and September too, somewhat). I’ve noticed that the spring and fall monthly averages reflect this kind of thermometer change more than the dead middle of winter or summer. I suspect because these transition months are more variable with latitude than the others. At an rate, it is worth noting that shifts in those months are more diagnostic of thermometer change. If it were a CO2 induced “global warming” I would not expect to see either the “step function” increase with flat trend on each side, nor the differential impact by month of the year. The other thing to note is that there is a pronounced seasonal variation to the data and the average is about 10C below the more tropical islands that make up the rest of the Pacific Basin Islands. I think it is an error to blend New Zealand in with the equatorial islands when looking for temperature trends. And this leads to a more general principle, IMHO: Trends (or the lack of trends) will be more visible inside bands of similar latitude. The file “Temps.507” is the raw data file fed into my program that makes the “by latitude” charts. “grep” is a commend that does a “global regular expression” application and “print”. In this case the regular expression has a start of line indicator and the stationID. The “-v” flag says “don’t let things matching the regular experssion, or pattern, through”. The result is put into a file named Temps.Sp.507 or a “special” version. The net effect of this is to make a copy of the Temp.507 input file with that one station removed. I then run the program that makes the chart and give it the special input. Finally “cat” or “concatenate and print” shows the results. Though in this posting I’m going to chop off the first 60 years or so. The thermometer count was very low and the numbers match the above list. It is in 1941 that the thermometer counts first diverge (the island enters the record), so that is where we see the impact of the island, and can see what it’s removal will do to the series going forward. Gee, look at all those 13.x and even 14.x temperatures! And our 2008 temperature at 12C is now a significant down trend from the high of 1998 1999 at 13.4 and 13.7 degrees. The temperature history is dominated by instrument changes and thermometer count changes. The best way to examine it, is one station at a time. Then take those individual trends and compare or average them. Averaging the raw data will simply let thermometer changes mislead your conclusions; unless you use it, as done here, to inform your ignorance about just how bad a strategy averging really is. So how does New Zealand stack up to the rest of the Pacific Islands? I put this as an update on the other Pacific Ocean posting, but it ought to be repeated here for the benefit of folks who only read a posting once. I’ve also added some station data below the temperature chart. It doesn’t get much more dead flat than this. ANY “anomaly map” or ANY claim that there is “Global Warming” in the Pacific is based on a fabrication of a fantasy. It just isn’t in the base data. Period. That next to the far right field is the average of the temperature records for that year. Each month also has a remarkably flat temperature series. The Pacific Ocean just does not change average temperatures very much. Run you eye down that far right and notice how the temperatures hang around 26 C to 27 C year after year, decade after decade. There is a bit of cyclical ripple, but even that is muted. What are those “Country Codes” at the bottom? Those are the places that were selected. The selection criteria allow 51 to select for any country with a country code starting with 51. So everthing from 510 to 519 will match. 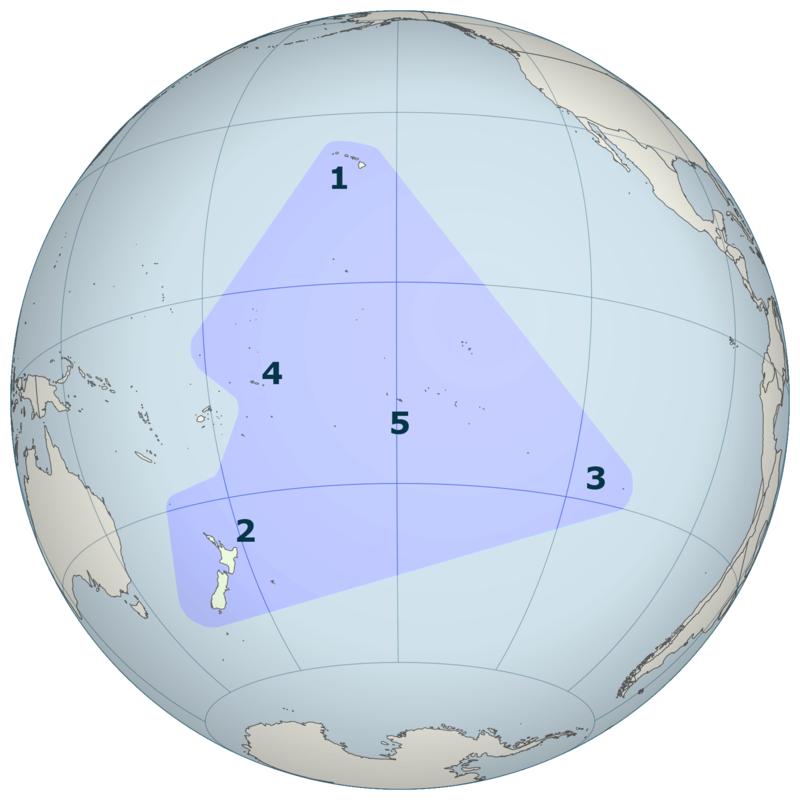 51x - 54x are various chunks of islands scattered across the Pacific basin. exhaustive for the Pacific Region. Here is a graph with Australia removed, but New Zealand left in. If I’m very lucky, someone will turn the above chart into an equivalent graph so we can “A/B” the two curves and see exactly what New Zealand does to the Region Average. I would expect the removal of New Zealand to make an even flatter graph. WIth such flat temperatures, were any thermometers moved? Here is the “thermometers by latitude” decades chart for the same islands part of “Region 5” for comparison. Oddly enough, we see significant erosion from both poleward directions toward the middle. (Though in fairness, some of the northern “wobble” in the 20N band is the WWII dropout that eventually recovers.) Most of these bands are 5 degrees wide, but the one from 5 South to 5 North is 10 degrees, 5 on each side of the equator. This is a band of constant type, so I mixed the two together. We can see that the 15 N band erodes into the 10 N band and that the entire southern half erodes in favor of the equator. With a big step function in the 1990’s in the 10 S and 5 S bands. One can only wonder what the temperature of the Pacific would be if the islands did not have Thermometer Polarphobia… Though in an odd twist, the 20 N band actually grows; picking up the losses from the 20 S and 15 S bands for no net change. Though equally interesting: Country Codes in the 51 block. Here we can see a fairly large block of ocean being sampled. Yet the thermometers run all over the place. How much faith can be put in the average of thermometers from even one patch of ocean when the thermometer may one year be at 20 S Latitude, and be at 5 N the next? By 1999, everything below 10 S taken out and sunk, while things between the equator and 5 N gain. Does somebody not like Tonga? Was there a revolution I missed? So the good news is that the temperatures are not going up. The bad news is that the thermometers are continuing to wander around the Pacific with a modest case of Polarphobia. And the worse (or better, depending on your reference point …) news is that the thermometer records seem to be far better at recording and demonstrating political actions, unrest, and wars; then they are at demonstration any warming trend. Hawaii is part of the USA, so their temperatures were amalgamated into the US averages. I wondered if there was some way to split them out as a group? The answer is fairly simple. The same systematic numbering that lets you pick out a continent, or a country, lets you pick out parts of a country. For the Hawaiian Islands and some other Pacific Ocean bits, that code is 4259. Ok, what does the temperature profile look like? For something almost as flat as a pancake, surprisingly interesting. We again start with a single thermometer. It is a smidgeon under 24C. We grow thermometers over time, then they get cut. Temperatures are generally in the 22 C – 23 C range until… in the mid 1970’s we start to get a drift up to the 24 C range again. While I can’t say if this was the Jet Age warming the airports with development, or if it was the PDO flip that happened about then, but I can say it happened just before the thermometer counts change. It was not thermometer deletions that caused a problem, as effect can not precede cause. With that said, the temperature does seem to “step up” by about a degree at about that time. But then it proceeds to hold steady again in this new regime. Three large airports full of jet traffic and tarmac. Hilo, Honolulu Oahu, Lihue (on Kauai). Wonder if there was a major build out of airports in the 70’s as Jet Air travel increased dramatically?… We also see something of a cyclical ripple, though 180 degrees out of phase with the mainland. While the 1930’s were hot in North America, they were cool in Hawaii. That PDO thesis looks good to me, perhaps with a bit of airport tarmac salt added. OK, knowing that we probably have an issue with the thermometer at the ocean of tarmac that is THE major airport in the middle of the North Pacific, what does the temperature averages history look like? Not at all what I'd expected. First off, we see that the history is very sort. Second we see that everything north of 23N has been deleted. Midway is about 2500 km WNW of Hawaii (The Big Island) per my little 12 inch globe, at a higher latitude, and different ocean currents. The chart at http://data.giss.nasa.gov/gistemp/station_data/ when comparing Honolulu and Midway shows about a 2 C cooler Midway. So I think I can now explain that sudden shift to hotter in about 1977. We lost Midway and the other northern island stations. So even in Hawaii we have had the thermometers showing Polarphobia and migrating toward the equator. I can think of no rational basis for the removal of Midway (or any of the northern Hawaiian chain) from the record. Ocean coverage is so spotty already that any additional coverage ought to be a Very Good Thing. I see no way to reconcile the steady temperatures of the Pacific Islands with their steady thermometer readings and any supposed runaway greenhouse scenario. New Zealand temperature history is much more consistent with someone playing with the instruments, than with any warming trends. And just how do you calibrate this composite instrument with all these comings, going, deletions, migrations, and instrument replacements and recalibration / recorrections? When wars, equipment change, and siting changes dominate the signal, just how do you propose to tease out of it that which is perhaps not even there? Frankly, there are just too many moving parts here to begin to know what the average of them all might mean. Crikey E.M. It just gets dodgier & dodgier. I would just about bet my left nut that if all the deletions in the 2000’s hadn’t happened that the record would in fact show that the world has cooled rapidly since 2007. Re the 2009 list of 9 stations for NZ. Hokitika Aero is about 25 minutes drive away from home. With the Surfacestations project in mind I photographed the climate station from all angles about 1 year ago. I fly from there (Hokitika) to Christchurch a couple of times per year. The climate station is situated near the terminal and around 40 m from the runway so you get a good look at it every time you fly. In the last 12 months there has been substantial change to the immediate environment of the station (after my photography). A substantial area of low scrub (largely gorse) was cleared by backhoe from land about 15 to 30 m away from the station. Given that no climate equipment was shifted I expect that the change in immediate environment would not have been reported. This is just one small issue for one more-or-less rural site situated about 1 km from the Tasman Sea. I suspect small changes like this are rampant and undetected within the global dataset. I am at a loss for words wrt what you are doing. Please keep up the good work. Looking at the table of ‘Pacific Basin without Aus and NZ’, I can see an urgent need for one of those machines that goes ‘ping’. The patient is flat-lining. I doubt that a more incisive statement has ever been written concerning the whole AGW hoopla. Here’s a thought. One could “re-instate” the deleted stations by using some fancy statistics to extrapolate the trends since the time they were removed using the patterns of those still in use. It wouldn’t be 100% accurate but it might give us a clue as to the real trend of land surface temperature across the world. This is interesting … kind of. (a) I can’t see any mention of sea temperatures despite ocean being really dominant in this part of the world. (c) I wouldn’t expect to see much warming in the Pacific, especially as I believe the global average temperature variation is a consequence of the Pacific’s bias towards El Nino since the Great Pacific Climate Shift of 1976. To put it simply it is the dispersion of tropical heat that drives global temperatures. Check a map of sea surface temperatures and you’ll find that it rarely gets much above 30C because at that temperature evaporation is high, leading to tropical clouds and heat transfer to the upper atmosphere. REPLY: ” It is a ‘real time science’ project. You get to watch learning and discovery happen in real time. Some like that, some don’t. (b) Australia is covered in another specific posting. Please see it. There we found that thermometer changes of location pollute the series with location noise. Since it dominates the total records for ‘Region 5’, this posting is to answer the question: What does the rest of Region 5 look like? In other words “This Behaviour Is By Design”. Just for interest, here is a plot of the NZ temperature history, with and without the Chathams, according to the data you posted above. Do you have a link to the raw station data for NZ? I’d love to analyze this a bit further. My apologies if you’ve posted it before – I had a quick scan through the recent Pacific posts but couldn’t find it. Bob , I believe it is Cambell Island not the Chathams..
For the NZ data merging the Campbell Island-free data (1939 to present) with the early (pre 1939) portion of the full NZ data appears to reveal a temperature step-change of about 0.5 to 0.7 deg C at about 1940. This might be related to the thermometer count and location issue. Otherwise the overall trend appears to be two relatively flat segments, pre 1940 and post 1940. There is no hockeystick in sight here. >Bob , I believe it is Cambell Island not the Chathams..
Typo fixed in the graph: here. From that example, it seems weather stations will march off to warmer places as a result of the demands of residents. I recall a similar issue here in Wellington some years ago when official readings were moved from Kelburn to the Airport – many residents were concerned that the temperature reports might end up being lower, thus making Wellington look colder compared to the rest of the country, and thus less desirable. They needen’t have worried – the airport is about 150m lower in altitude than Kelburn. Yes, the arithmetic average of the data with and without the island produces a different average temperature. Of course it will. But is your claim that GISTemp is doing arithmetic averages of absolute temperatures. If so that would be mathematically and scientifically illiterate of them. A High school Maths student should be able to spot that. And that is not what they and the other temperature record providers claim that they are doing. They all claim that they are doing different forms of area weighted averages of individual station anomalies which is valid, apart from any question marks about how the area weighting is done, adequacy of station coverage, time variant site specific conditions etc. Are you claiming that their analysis technique is totally at odds with what they claim it is? Not a bit at odds. Totally? REPLY: [ My point is very simple, and has little to do with GIStemp (it has its own issues, and many of the things it does ARE valid [like modification flag suppression and combining Antarctic data, or the idea of anomaly processes], but some are just broken. In particular, the UHI is daft and the “basket A” to “different basket “B” anomaly process loses the major advantage of anomaly processing and opens the door for instrument bias to leak through. It also ought not to delay anomaly calculation to the last STEPs. Yes, GIStemp does a lot of processing using averages of temperatures long before it reaches the “anomaly creation” that comes near the end. I believe that is part of why bias leaks through it). So forget about GIStemp when looking at the DATA and characterizing the DATA. (As opposed to any process done on it by anyone). The point here is to look at the DATA first and see what you must confront. Later you can ask how does GIStemp or any other code deal with the BIASES found in the data here. What I am doing is more akin to “signals intelligence” than climatology. I’m “characterizing the data”. The key there is DATA. And NOT temperatures. So you take a look at the New Zealand DATA. Yes, just the simple average of it. And no, there is nothing wrong with looking at a simple average of temperatures and no it is not “illiterate” to do so. I’m not expecting the result to be a TEMPERATURE. I’m expecting it to tell me about patterns in the DATA. And that is all the difference in the world. So IFF New Zealand were generally warming over the decades, there ought to be a WARMING SIGNAL buried somewhere in the DATA. (NOTE: Not one word in that sentence is the word temperature…) So we go looking for what part of the DATA carries the WARMING SIGNAL. This is rather like looking for an encrypted message hiding in an unencrypted cover text, but much easier. We are not trying to decrypt the text (or know the actual temperature change) just find where it is being carried. It easier than cryptanalysis for the simple reason that if New Zealand were warming, we ought to see a general increase in the size of individual data items over time so the average of them also ought to rise over time given the narrow climate ranges of New Zealand near sea level where the thermometers are located. (At this point, we come perilously close to temperatures.) And that is exactly what we find. The crude average rises. But with a bit of a step function. Not the smooth pattern one would expect from smoothly increasing CO2. Then we look inside the set and find that the increase in the average over time is from a single cold station as it leaves the data set. The rest of the data, as an average, shows little in the way of a “warming signal”. It just is not carrying that information. (This conclusion is made even easier since the New Zealand data come largely from a single small area. Basically, you can think of it as a single GRID / BOX if you like). So with almost all the WARMING SIGNAL being carried by instrument change, we can readily conclude that the INSTRUMENT CHANGE is the dominant signal present for New Zealand. Further, when we look at the size of the signal left in the New Zealand DATA after that particular INSTRUMENT CHANGE is removed, it just isn’t much at all. About the size of the UHI signal. The reasonable conclusion is that there is very little to no CO2 warming signal space available in the DATA. Basically, INSTRUMENT CHANGE and UHI (both clearly proven to be real) can account for all the bandwidth available to carry a warming signal. There is no room left for CO2 as a warming signal. and you will find a New Zealand report inside of it. That report, too, finds very little ‘warming’ in New Zealand. We are about 1/2 C ‘warmer’ than many other similar periods of New Zealand history. About what you would expect from the normal decade+ cycles of natural variability and UHI. In the end, the raw average lets us see where the warming signal is carried, make good guesses about what we ought to address (instrument change, UHI) and measure the likely size of what is left over. Then, after further analysis code is written, it lets us measure how well that code deals with each of the signal carrying components of the data. That’s the part I care about most. To add further to Paul’s comments above, Taupo now has its weather station next to the ambulance car park and there was even a barbeque there last time I looked.